Is it wrong to want to taste Krsna? Wouldn’t that desire be sense gratification? Shouldn’t we just serve without any personal desire? These are important questions to address. There is a difference between taste in Krsna consciousness and sense gratification, although they can seem similar, and thus difficult to distinguish. We discuss this difference, as well as the necessity of developing the proper taste for Krsna consciousness. (This newsletter is an edited transcription of a lecture I gave on Krsna.com). What is the motive behind sense gratification? It is simply to squeeze the maximum amount of pleasure out of our senses. This is the sum and substance of material life. It is also the sum and substance of animal life. Our senses are also gratified in Krsna consciousness, but there’s a huge difference in the motive with which we engage our senses. When a devotee reaches higher levels of Krsna consciousness, he is not focused on what will or will not make him happy. His only thoughts are how to make Krsna, his gurus, and the devotees happy, and how to give Krsna consciousness to others. In this way, a devotee never considers his personal happiness. Non-devotees are often in a state of anxiety thinking, “Will this work out, will that work out?” These anxieties are, of course, related to personal well-being. A devotee however, is never in a state of anxiety about his personal life. Rather, his only anxiety is whether things will work out for Krsna’s service. This is the real stress relief formula. Once you stop worrying about yourself and start worry about making guru, Krsna, and others happy, your material anxieties will be gone. Devotees once wanted to buy a huge church in Toronto to convert to a temple. Since it was very expensive, Srila Prabhupada told them not to get it because, “You’ll be buying anxiety.” When Prabhupada later returned to Toronto, he asked the temple president if he purchased the temple. The temple president said, “No, since it is so expensive we would be buying anxiety.” Amazingly, Prabhupada strongly replied, “There must be anxiety for Krsna. Otherwise, there will simply be anxiety for sense gratification.” So all of our anxiety should be in relation to how we can best serve Krsna and help others come to Krsna consciousness. Taste is a by-product of pleasing Krsna’s senses. Therefore, we should never run away from trying to gain a genuine taste in Krsna consciousness, thinking it to be sense gratification. Taste in Krsna consciousness is very different from the taste of sense gratification. One comes as a by-product of purified senses and the other as a by-product of lust. Taste for Krsna is juxtaposed to sense gratification. 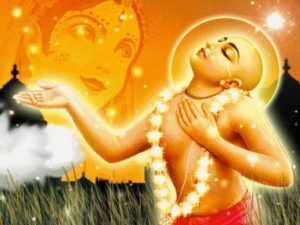 When we are hankering after sensual pleasure, or particularly when we are engaged in it, the so-called pleasure we get nullifies our senses’ ability to perceive, or desire, pleasure in Krsna consciousness. Conversely, a higher taste in Krsna consciousness nullifies the taste for sense gratification. When our taste for Krsna is strong, we will be disgusted to even think about past sense gratification. The very things that we used to hanker for, the things we used to love to do, eat, hear, talk about, see, etc., will become distasteful. The problem is that since Krsna is all-attractive, His external energy maya, is also attractive (after all, it is His energy). Srila Prabhupada said maya means that other things become more attractive than Krsna. I was listening to a conversation in which a devotee was telling Srila Prabhupada how some priests have girlfriends, get married, or become homosexuals. It was even common for some priests to become alcoholics. Prabhupada replied, “Yes, they must fall down because they are not getting a taste.” So without Krsna we are guaranteed to be attracted by maya, even if we don’t want to be, and even if we try hard not to be. We do not “fight maya” simply with discipline. We fight maya through the taste that engagement in Krsna consciousness gives us. We are unfortunate if we believe anything outside of Krsna consciousness will give us a taste in life. The irony is that the stage of ruci (or taste for Krsna), which gives us real happiness and pleasure, comes after material desires are given up. In other words, the material things we think will make us happy are actually the very things that prevent us from being happy. Srila Prabhupada once said in a letter written in January 10, 1972, “Our business is simply to plant the seed of devotional service wherever we go, and to give everyone a taste of this transcendental experience.” If people get a transcendental experience, or taste, it will be a huge faith builder for them because they will experience pleasure beyond the senses. And when people get a taste for Krsna, they will want more. It is essential that we understand taste as an experience that results from relishing Krsna consciousness with purified senses, and that taste has nothing to do with material motivation. Taste is something all great devotees hanker for. Even the Lord Himself hankers for it. If we see ourselves becoming more inclined and attracted to Krsna, we are on the right track. However, if we see ourselves becoming more attracted to mundane things, we should understand something is wrong. So taste is a useful meter with which to monitor our advancement. And what is the result of chanting without taste? Bhaktivinoda Thakura answers this question in the Harinama Cintamani. If you have the idea in your mind that, “I shouldn’t want taste,” understand that we’ll always be motivated by taste. So it’s just a question of what kind of taste will motivate us. Just as material taste is drawing us closer to maya, spiritual taste is drawing us closer to Krsna. We should want taste, pray for taste, and hanker for taste. We need taste. Don’t be afraid of tasting Krsna consciousness. Be afraid of enjoying Krsna consciousness. We want to serve Krsna, not enjoy Krsna. The paradox is that if we serve, we end up enjoying Krsna consciousness. Krsna consciousness is not derived from the desire to enjoy. Indeed, it is pleasure that removes the desire to enjoy. Perfection is to taste the nectar of Krsna consciousness.